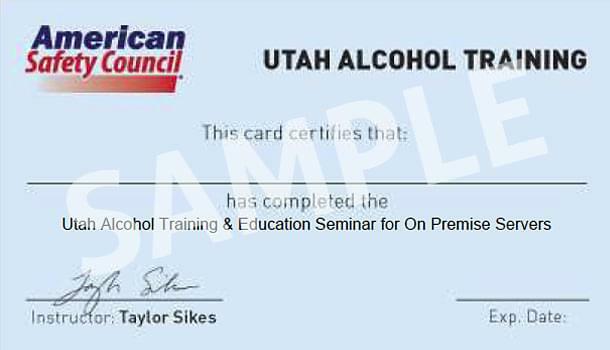 About Our Program: Our courses are designed to educate workers on the Utah state requirements and safety standards necessary to server and dispense alcohol. The responsibility to recognize intoxication, unlawful purchasing and when to intervene is a big one - and sellers and servers need to have appropriate training. We've designed our courses to be affordable, easy, and effective, and ensure each student can get what they need to get on the job. On-Premise alcohol server training is a total of 3 hours and off-premise alcohol training is a total of 1 hour. Both have a final exam with unlimited attempts to pass with a 70%. The proof of completion provided when you pass this alcohol training is instant! 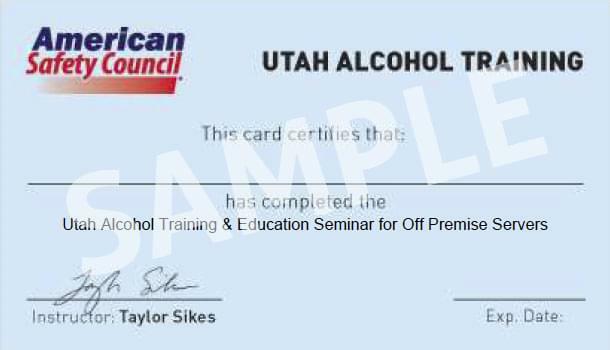 We call it our O-PASS and hope you can remember not only is it necessary to have completed this training to begin work, but it's important to know your On/Off Premise Alcohol Serving Safety! Upon successful completion, students will be provided with a certificate/card instantly for download to print and go. There is no extra charge. In addition, we will report your completion to the state of Utah within 30 days. It's Easy and Fast, Just Remember O-P.A.S.S - On/Off-Premise Alcohol Serving Safety!